[uds-billboard name=”walker”]Growing up in Minneapolis and Saint Paul in the 1980s, the cities had largely lost their likeness to Garrison Keilor’s arcadian (and fictional) town of Lake Wobegon. The cities had been transformed from a sleepy milltown to an oversized collegetown almost overnight. The University of Minnesota, which is currently the fourth largest university in the nation with over 50,000 students, lies at the center of the Twin Cities both geographically and culturally. The lure of grad school and a chance to escape the confines of the East Coast drew my folks, and many of their transplant friends, to Minnesota during the coldest decade on record. As a result, I grew up in a community of artists, writers, designers, poets, architects, and yes, there were even a few Lutheran Ministers in the bunch, too. This community supports, to this day, two major cultural institutions—the Guthrie Theater and the Walker Art Center. These two spaces form the focal point around which a myriad of theaters and galleries revolve. For as long as I can remember, there has been tension between these smaller venues, as well as individual artists, and the two larger institutions. When tensions are high, artists might be deemed ungrateful for the cutting edge programming that the Walker and the Guthrie regularly generate; on the other hand, both institutions might be accused of intentionally keeping ‘the keys to the kingdom’ out of the hands of local artists and writers. Such barbs are rarely thrown these days when there is consensus that all parties need each other in order to thrive. The arts community in the Twin Cities is also unified by the unflappable (although rarely articulated) belief that, despite the brutally cold winters, this may be one of the greatest cities in the United States. “Minneapolitans” and “Saint Paulites” are wildly optimistic about the future of their city in a way that presumes that anything is possible. This spirit fuels the arts community to this day. The following interview took place with Bartholomew Ryan, an assistant curator at the Walker Art Center, on September 29th, 2012. 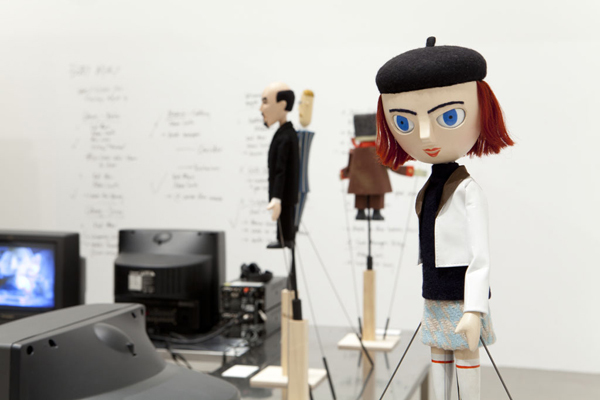 In 2011, Ryan co-curated two solo exhibitions: Goshka Macuga: It Broke from Within and Pedro Reyes’s Baby Marx. In the summer of 2012, he was the Walker’s organizing curator for the MCA-originated exhibition This Will Have Been: Art, Love, & Politics in the 1980s. Currently, Ryan is co-curating Painter Painter (February 2013), an exhibition that explores emerging tendencies in abstract painting, and is curating 9 Artists, an international group exhibition that opens October 2013. Ryan holds an MA in Curating for Contemporary Art from the Center for Curatorial Studies at Bard College and has contributed to international publications such as Metropolis M, Kaleidoscope, and Artforum. Regan Golden: How and when did you decide to become a curator? Bartholomew Ryan: Around 2005, I was living in New York and becoming more involved in the art world and more engaged in the debates around contemporary art practice. At the time, I was an actor and was about to move back to Ireland, when I read Hans Ulrich Obrist’s Interviews, the first anthology of his conversations with artists, composers, designers and others. I became interested in a field that would have room for all these different voices and could encompass them within it. This was my first attraction to contemporary art. At the time Doubt was a smash hit on Broadway, and the NYT was calling it a masterpiece, so with that in mind the field of art seemed to have more promise. Also, my partner at the time was, and is, a very good artist, and he helped to train me in, in terms of how to look at contemporary art. We published a magazine/artist book called Lab Mag which is still available online. It was an experiment in looking at different practices that aligned at the time. It was an attempt to create a community of interests among the featured artists, designers, poets, and others. We did that with David Reinfurt of O-R-G, later of Dexter Sinister and Sarah Gephart. Eventually, I went into the curatorial studies program at CCS-Bard and then landed at the Walker on a fellowship. Golden: What are the challenges to being a curator in the Midwest? What are the advantages? Ryan: There are definitely more advantages than disadvantages. I am speaking mainly here about Minneapolis, which is the context I know of. Minneapolis has a robust art scene. I think it benefits from not being large enough to see itself as in competition with Los Angeles or New York; there is a kind of lightness to the art world here, which is really productive. You can get a lot of work done and still have time for experimentation. There is a great feedback loop between the Walker and the artist community, along with foundations like the McKnight and the Jerome that also create a lot of support for artists. Being a curator here you have a little bit more mind space: it’s not that you aren’t busy, but Minneapolis is not a cutthroat opinion factory like New York. I feel like there is time to think through projects differently because we are not entirely under the sway of these two poles (New York and Los Angeles). For that reason, the Walker has, for a long time, had a very global outlook. We are able to do shows here that probably would not have emerged in these other centers because of the different eye that one can develop here. What’s hard about it is that, while the scene is very strong, it is difficult to also have an organic connection to how artists are working in larger centers. You make short trips, visit galleries and do studio visits, but some of the more spontaneous practices are harder to stay in touch with. You figure out ways to work through that by using Skype and other devices, also many artists come visit us here. Pedro Reyes. “Baby Marx” Installation view. Walker Art Center, 2011. Golden: What is a challenging part of your job that either artists or viewers might not see when they are walking through an exhibition at the Walker? Ryan: Trying to balance everything, trying to serve all of the different interests that one has to serve as a curator. Most obviously, we are the intermediaries between three contingencies: the artist, the institution and the public. The Walker has always had a strong desire to represent the practice of the artist to the public, which means that the role of the Walker is often to mediate these two entities to each other. Some museums may tilt the balance towards the public, or, as is often the case with smaller alternative spaces, towards the artist, where there is less concern for the general public. Keeping this balance is one of the internal struggles we have within the institution, which is also what makes us quite strong over time. To ensure that the institution is resonant, we constantly debate how best to strike that balance. Some contemporary artists’ practices are not very legible and they may not have had a lot of experience working with broad audiences, so you have to bring them with you without compromising what they do and maintaining the layers of complexity in their work. It is not that we are always successful in this regard, but we try. Golden: [laughing] And that is more than some museums are willing to do! Ryan: I don’t know if this is difficult exactly, but it is part of what it means to do this job. Being a curator at the Walker is a very complex job with a lot of different points of entry that you need to contend with, but this makes it a great job too. Regan: When I last talked with you, the exhibition Baby Marx by Pedro Reyes, which you co-curated with Camille Washington, had just been completed. 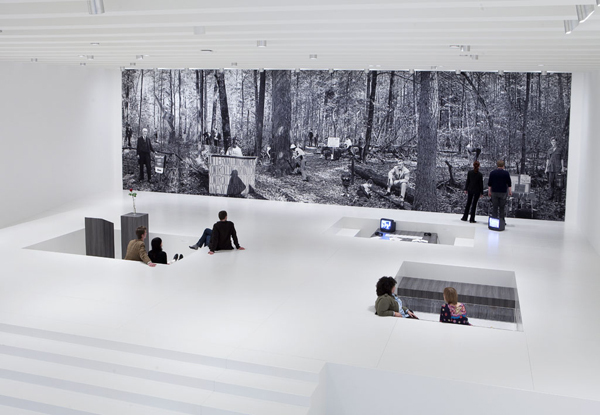 How did this exhibition influence your curatorial practice? Did the conversations between economists and political theorists that you held for a general audience inside the installation change your thoughts on what is possible as a curator, or alter the way you understand the interaction between the audience and the artwork? Ryan: Baby Marx is a project that I am very proud of. It is an example of how I would like every exhibition I am involved in to exist. It is a project that formally, in terms of all the different platforms we developed for it, matched the practice of an artist like Pedro Reyes who has such a heterogeneous way of approaching the world. His work is very discursive, but also humorous. He has a flexible, fluid way of doing things, which we tried to adapt to as an institution. 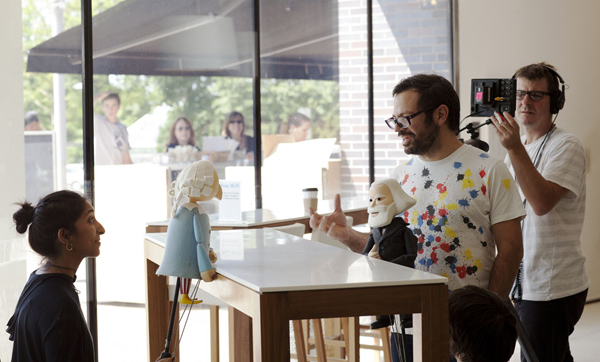 With this exhibition, people all over the world could watch scenes on the Walker Channel that Reyes shot at the Walker such as On Alienation, where puppet versions of Karl Marx and Adam Smith kvetch over a cookie in the Walker cafe. Adam Smith wants some of Marx’s cookie who declines, so Smith says something like, “You should share the cookie because you’re a communist, so you share the wealth” and Marx replies, “Well, you’re a capitalist, you want a cookie, go buy a cookie.” There is humor, but also something serious I think about education and how ideas travel and become purified over time as if they are not founded in specific historical circumstances and forgetting that they emerge from tangible and flawed individuals. These scenes were more or less improvised and were meant as sketches for some future approaches to the project. In other words, the Walker became a test site for Pedro to develop the project in real time. Pedro got to try out a lot of ideas, and I think he made a real breakthrough by working for the first time in such an informal way with the puppeteers (cast locally from the amazing puppetry community here). Previous versions of the project had been heavily scripted and I think it needed to evolve from that somehow. We also had this amazing conversation between Reyes, and the theorists Lauren Berlant and Michael Hardt, which got a huge turn out. The exhibition was pretty responsive to real events, it opened around the time of the London Riots, and then the Occupy movement started, so Pedro and the puppets also shot a scene in New York’s Liberty Plaza. Then we held events in the gallery, like the Town Hall that we titled “How to Survive in America” between a neo-liberal economist and a Marxist theorist. Golden: They then played the parts of Smith and Marx, right? Ryan: Right, not literally of course, but they attempted to approximate those positions, neither one of them was that trenchant but they pretended they were up to a point. Personally, I think what I got out of the talk was the ultimate bankruptcy of both positions, which is not to take anything away from the good humor and intelligence with which the panelists approached it. There was lots of opportunity for feedback from the audience as well, so the conversation felt very present and connected. Golden: I watched it on Youtube and it also seemed very productive, when many debates are not these days. I liked too that, unlike the conversation with Berlant and Hardt, the town hall debate took place inside the gallery alongside the library set that Reyes built to shoot scenes between his puppet versions of Marx and Smith. Ryan: I am just very happy that we were able to do a show that had many different ways for the audience to approach the work, and did so while staying true to the artist’s way of working. The successes of the show can also be attributed to the work of our Education & Community Programs department. There were a lot of conversations between departments that went into this exhibition. This is true for most shows at the Walker, but I feel like we really got it right on that one. Golden: I read on your blog on the Walker Art Center’s website that you are part of a new Interdisciplinary Work Group (IWG) that the museum is launching. Describe the IWG and how this came to be and what its purpose will be within the museum? Ryan: A few years back the Walker received a grant from the Bush Foundation to think through how it, as an institution, works across disciplines. We are doing a yearlong investigation into the term “interdisciplinary.” The first phase is to briefly step away from our individual day-to-day concerns at the Walker, in order to look at how our work collectively might create a philosophical framework for defining the interdisciplinary. The second phase is to think about how we can organize projects that are necessarily cross-departmental projects without it being too much of an additional strain on the staff and where we can have fun doing it. We are often working with artists who are working in an interdisciplinary way anyway, so a lot of it comes down to thinking about how we can share resources more smoothly and exchange ideas more freely, in order to create a productive environment for artists to work in and for audiences to engage with. Golden: Do you have a steadfast curatorial philosophy or do you feel that your role as a curator shifts from project to project depending upon the artists you are working with? Ryan: My curatorial approach is very relational and adaptable, which is a firm position in its own right. I think it happens to all the Walker Visual Arts curators where people ask us what our specialty is, and there are certain curators who have really strong backgrounds in prints, photography, or film for example, but I think what aligns us is a contemporary outlook. At the Walker, there is an attention to scholarly detail and that type of rigor, but our approach is also amenable to the context of the artist we are working with and what they bring to the table. The way I like to work is to be adaptable to an artist’s way of working and then engage them to a certain degree in the way that they wish to be engaged. This approach doesn’t mean I abandon all ideas of an audience, but you have to give yourself a little bit to their practice, and those practices are invariably very different. In the world we live in now, which is so horizontal and full of information, each artist you work with has a deeply subjective cannon that they draw from; it is not like we are all working from the same textbook. There are interests that I have and ways of engaging the culture that certainly impact the artists I want to work with, but that framework is harder to articulate. Although, I think that it comes through in the exhibitions that I do. 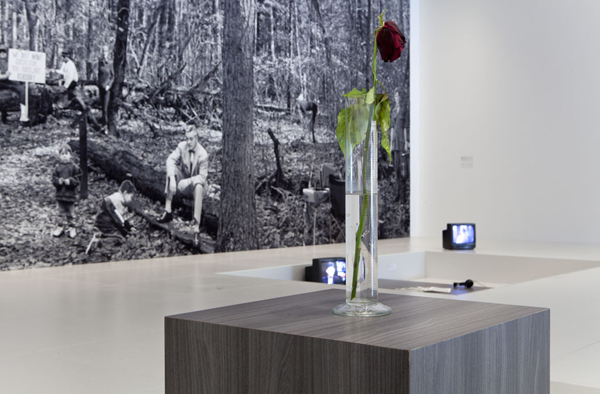 “Goshka Macuga: It Broke from Within” Installation view. Walker Art Center, 2011. Golden: So then, what sparks your interest in an artist’s work? Ryan: I just finished the catalog essays for five local, emerging artists who received grants from the Jerome Foundation: I loved meeting them all, seeing the work, and listening to them talk about it. I find an awful lot of work interesting, but I don’t have time to pursue it all, obviously. I guess I do have alarm bells that ring in encountering some artists, for instance, if they are connecting their work to certain ideas of progress, or taking a blandly universalist or patriarchal viewpoint, these are things that turn me off. And of course there are artists whose work I am particularly drawn to. Golden: And how would you characterize that? Ryan: What attracts me to certain artists’ work is . . . [long pause] . . . a certain broadness of outlook together with a formal, material, or conceptual complexity. I am working on two very different shows right now: Painter Painter, which is artists who have a very strong studio practice within a specific medium and 9 Artists, which is largely post-medium artists who work in a variety of different ways. I think most people would divide these two groups of artists and pit them against each other ideologically. But I think there is actually a real consistency in their approach to the world—a certain engagement with the lived world that is then processed very differently within individual practices. I am looking for a kind of commitment that is about the iteration of a certain set of stakes that can be multifaceted, and hard to pin down, but I know it when I encounter it. This is a very difficult question to answer because there are no fundamental criteria. Golden: Can you say a bit about these two new shows you have in the works? Ryan: The first show is Painter Painter, which I have been working on for almost two years now with my colleague Eric Crosby who is also an Assistant Curator. One of the nice things about it is that, for the most part, we have been able to do multiple studio visits with each of the 15 artists in the show. Painter Painter began with the question, in a contemporary art world where the artist-as- free-agent can work without obligation to medium, why choose the materials of painting today? In the critically aligned art world of the last 30-40 years, there has been this expectation that for a painter to continue as a painter there has to be some basic level of self-reflexivity, some wry acknowledgment of the problematic status of continuing to paint in the postmodern era where painting itself had been toppled from its lofty perch. Golden: Laura Owens work just popped into my mind! Ryan: Although this is an important approach to painting, I think there are young (and old, this is not necessarily a new thing, though I think our ability to support it is) painters out there who don’t see painting as this hugely burdensome medium that they somehow need to account for. As we were doing studio visits it became clear that each of these artists is approaching their medium in a very open-ended way, often exploring minor histories and what Eric and I refer to as relational nuances of making. All of them work in what might nominally be called abstraction, but it’s not abstraction with a capital A. Abstraction has become such a concrete historical precedent that its use now almost always becomes representational through the way it conjures past styles. Nevertheless, where representational aspects occur, it’s not so much citation as referencing and moving on. This exhibition is really about that conversation, the moving on, it’s about a certain freedom and enthusiasm within and around the medium that feels to me quite refreshing. Also, while the exhibition will have a strong online component and programming, I like that with this show, people will really have the opportunity to look and engage with objects. Golden: That’s a change for the Walker in some ways. One of the things I thought was most intriguing about Baby Marx was that the work confronted large societal and philosophical problems through these beautifully made puppets. You just wanted to touch them and be with them. That physicality is sometimes lost in more conceptual work and I look for a balance between the two. 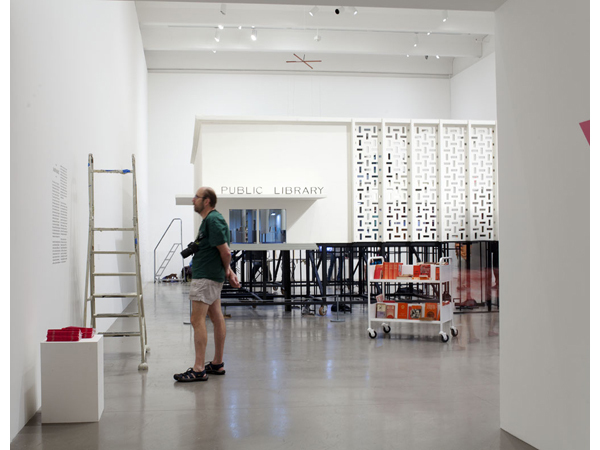 Liam Gillick’s show at the MCA in Chicago was the thing that put me over the edge. I just thought, I can’t take it anymore! I need to see objects too! Ryan: That’s funny because his work is included in 9 Artists. I actually think Liam’s objects are beautiful. Golden: Yes, and there were none of them in the MCA show! Ryan: Well, there was the ceiling. Golden: True. So tell me more about 9 Artists? Ryan: 9 Artists is an attempt to create an exhibition that doesn’t have a set philosophical underpinning, but is about an accumulation of different sets of practices. I want to create a space that allows the audience to determine what the themes, arguments and threads of the exhibition might be, while also affording them some tools to do so. There will be enough work by each artist and enough attention by each artist to what the other artists will be including in the show that the audience really will have a chance to make connections. This show is also a response to the relativization of criteria in the world in which we live. In the past with numerical exhibition titles there was the assumption that of course there was a connection between these artists’ works and that they were clearly aligned with a particular movement. If MoMA did this, for instance, it was seen as the inevitable moment of the artists’ emergence within the cannon. We live in a very different time now where most artists are much more resistant to categorization. The desire among curators to name and frame a movement has transformed into a desire to somehow capture the global zeitgeist, by way of major international exhibitions that successively attempt to find novel ways to diagnose the present. I want to create a show that is positioning these artists as if they are part of a movement, which of course none of them are. It’s an attempt to galvanize a temporary cannon. There are themes that have emerged almost in spite of this. For example, each of the artists has a really interesting relationship to ideas of identity, biography and self-presentation, frequently using various tropes associated with these words in subversive or antagonistic ways. Some artists have approaches that counter others who are in the show. Each has an expansive practice: they are writers, publishers, designers, performers, and lecturers. There is this multiplicity to how they exist as cultural figures and actors. Golden: So they are artists and then they are all these other things as well. Ryan: Or, they are all these other things and so they are artists. Golden: One feeds into the other. Ryan: I think it is a broad, really ambitious, idea of what an artist is. Golden: These two shows sound like they couldn’t be more different. With Painter Painter you have artists clinging to the medium-specificity of painting, which is in crisis precisely because of the work of the artists in the second exhibition, 9 Artists. These exhibitions represent two different poles that often antagonize one another. Maybe not specifically the artists in these shows, but these viewpoints are often played against each other in the art world. Ryan: And I just think that is silly! These are all contemporary artists, just working in different ways. They might disagree with me though, and I don’t want to create this relativised continuum of practices either. I do think people have often attacked painting because of its market friendliness. It is certainly true that painting historically has had that market, but today, you can be the most conceptual dematerialized artist out there and have a much bigger market than an artist who might be maligned because they make objects that look nice in a living room. Golden: Shifting the conversation a bit, you are originally from Ireland, how has growing up there influenced your curatorial direction, if at all? Ryan: I wasn’t involved in the art world while I was in Ireland, but I was really involved in experimental theater. I think that might be an influence on how I work: working collaboratively, but also being attuned to how people make decisions. Ireland is just a really interesting place to grow up, it is very social. [pause] This is a very difficult question for me to answer. Golden: After living in Minneapolis now for four years, how do you think the Walker influences the vibe of the city? Ryan: I did an exhibition with the artist Goshka Macuga, which, among other things, was about the history of the Walker in relationship to the Twin Cities. That show provided an excellent education for me because I saw how crucial and layered that relationship is. It has had many different phases over the 73 years since the Art Center was founded: sometimes the Walker has been called to account by the community, and sometimes the Walker has called the community to account. Ultimately, this is how I feel: the Walker is a resource and the city is a resource. There is a constant conversation. As long as the Walker is healthy, it will be because of its engagement with this community.